Hybrid, or blended, classrooms are expanding on campuses across the United States (and internationally). Intentionally combining in-class instruction with online activities not only aids student learning, it also provides more self-directed, technology-mediated learning experiences for students who will incorporate technology into their professional lives post-college. 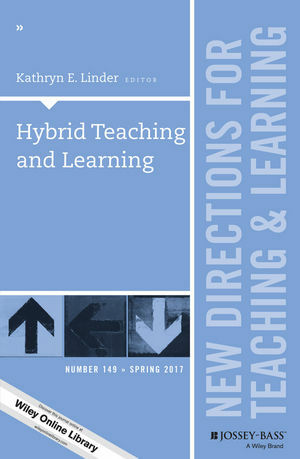 • What is hybrid teaching and learning? • How does it promote student learning? • Why should faculty and administrators consider it? • How are its components different from traditional classrooms? • What are the best practices of hybrid course design? • How can instructors incorporate accessibility into their hybrid courses? • What models can be used to train faculty as hybrid teachers? • Where is it being practiced? • How can institutions best prepare students for and promote their success in hybrid courses? • Who should be involved in implementing and supporting these initiatives at the institutional level? This is the 149th volume of this Jossey-Bass higher education series. It offers a comprehensive range of ideas and techniques for improving college teaching based on the experience of seasoned instructors and the latest findings of educational and psychological researchers. Kathryn E. Linder is the research director for Oregon State University Ecampus.